For Lucy Hulon it’s certainly not the case. 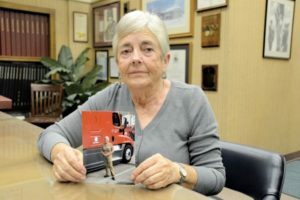 The 71-year-old Godwin resident recently graduated from Roadmaster Drivers School in Dunn and began putting her newly-acquired skills to use for U.S. Express. Her past life experiences are a far cry from the smell of diesel and the sound of 18 wheels clamoring along the highway. She worked as a meat cutter, school bus driver and helped her husband, Butch, restore cars. Her husband told her to do what makes her happy, so she walked into the doors of the Roadmaster school and the rest was history. It took her the usual six weeks to complete training, not without asking for a little help to overcome some rough spots. She credits one of the instructors at the school — Michael Reaves — for showing her how to properly back a truck at two different angles. Lucy Hulon is a 71-year-old wife and grandmother who decided she was tired of sitting around home. She enrolled in truck driving school and now she’s a licensed trucker. She poses with a photo of herself and her truck. She now drives for U.S. Express, headquartered in Georgia. Her request got an immediate response, the instructor gladly gave her some extra help and advice to get the rest of the way through the course. Mrs. Hulon said she wants to see others follow in her footsteps, especially those in the later stages of life who are just sitting around waiting for the inevitable to happen. She believes everyone has something more inside them if they’ll just get out and bring it out. One thing is for sure, age didn’t seem to play a role in whether or not she got her first driving job with U.S. Express, more so than with the parent company of Roadmaster, Werner Enterprises. That’s where her past came back to haunt her so to speak. Many years ago Mrs. Hulon said she had to use a c-pap machine to prevent sleep apnea. It was for those reasons Werner Express gave her what she felt like was the runaround before hiring her. Her next stop was with U.S. Express who gave her the opportunity to present all she needed to get hired. Mrs. Hulon put a lot of doubters to the ground when she walked into the DMV and walked out with her Class A Commercial Driver’s License. Even her family expressed some concern she would finish the course successfully. One of the best examples of her determination to complete the course came early on when a fellow student, many years her junior, challenged her by expressing a belief Mrs. Hulon wouldn’t be around for graduation. The irony of it all, the young girl was dropped from the course because she couldn’t do what she had challenged Mrs. Hulon to do. While she admits just passing the course was a bucket list item, Mrs. Hulon says the future and all it holds is a part of the same list. She has already traveled across several states and as far as Maine to the north and Kansas to the west, all while still in her training. For now, Mrs. Hulon will just enjoy what she’s earned and make her way into the logbooks as just another driver.